Space shuttle Endeavour is seen at the Kennedy Space Center in Florida atop NASA's modified Boeing 747 Shuttle Carrier Aircraft (SCA) at sunrise on Sunday, Sept. 16, 2012. Space shuttle Endeavour's trip to California has been delayed by a weather front in its way. NASA on Sunday (Sep. 16) postponed Endeavour's final liftoff from Florida, planned for Monday morning, just a few hours after rolling out the shuttle atop its modified Boeing 747 Shuttle Carrier Aircraft (SCA) to be ready for the flight. Endeavour is being flown to Los Angeles, where it is going on display at the California Science Center (CSC). "To ensure a safe flight for Endeavour and the [Shuttle Carrier Aircraft], NASA managers, in consultation with the California Science Center decided Sunday to delay the flight because of inclement weather predicted along the flight path between Houston and NASA's Kennedy Space Center, where the flight will originate," NASA explained in a statement announcing the one-day delay. The space agency had planned a four-leg, three-day ferry flight for Endeavour, with the first stopover in Houston at Ellington Field, located near the Johnson Space Center. A cold front approaching Houston has slowed and was not expected to clear the area in time for Endeavour's arrival on Monday. 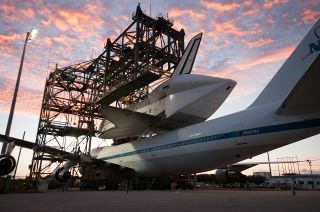 Originally, NASA had scheduled Endeavour to remain in Houston for two nights, before departing for points west. If the weather forecast cooperates and the ferry flight begins at sunrise on Tuesday (Sept. 18), the shuttle will now spend just one night at Ellington before resuming its original flight plan on Wednesday. NASA managers will meet on Monday morning to assess the weather forecast for a Tuesday departure. After departing Houston and making a stopover to refuel at Biggs Army Airfield in El Paso, Texas, the carrier aircraft will fly to Dryden Flight Research Center at Edwards Air Force Base in Southern California. Endeavour will spend the night there, marking its final visit to the space shuttle fleet's primary West Coast landing site, before embarking on the last leg of its final flight on Thursday morning. From Dryden, the SCA will fly Endeavour north for scenic flyovers of Sacramento and San Francisco, before circling Los Angeles and landing at LAX by noon PDT (3 p.m. EDT or 1900 GMT). A ceremony will welcome Endeavour before shuttle workers begin the process of removing the orbiter from the aircraft using two large cranes. Endeavour will spend several weeks in a United Airlines hangar before leaving the airport on Oct. 12, beginning a two-day, 12-mile (19-kilometer) road trip to the California Science Center. Traveling atop a wheeled transporter, the shuttle will be paraded through the streets of Inglewood and L.A. to arrive inside the CSC's Samuel Oschin Space Shuttle Endeavour Display Pavilion. The science center will open its new pavilion to the public, debuting Endeavour on exhibit, on Oct. 30. The youngest of NASA's orbiters, the shuttle Endeavour entered service in 1992 and flew 25 missions. It spent 299 days in orbit and orbited Earth 4,671 times while traveling 122,883,151 miles (197,761,262 km).